Note: This knowledge base article covers the Form Conditions feature on our legacy Smart Forms. This feature is not available in the newer ONTRAforms or in built in forms in ONTRApages. 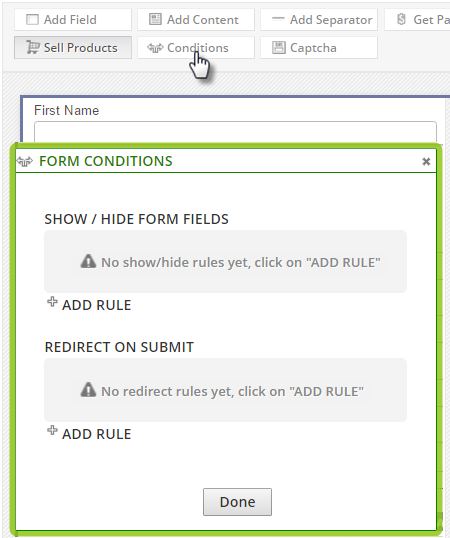 Form conditions allow you to add conditional actions for form fill-outs. They are useful for showing relevant info on the form according to the type of lead or routing leads to relevant thank you pages upon fill-out. Be sure to test out your form conditions before they go live on a page by using an ONTRAPORT hosted form. Want to reveal or hide fields (and content elements) based on people’s responses on other fields? For instance, if they selected that they have a dog in the type of pet field then you can set a condition that causes the type of dog field to be revealed as a result. Note: Be sure to select a "Default Selection" in the Field Settings for any multi-value field such as a drop box before creating the Conditions. Set what the field value must be in order to cause the subsequent fields to be revealed or hidden. You can also set multiple conditions per field reveal. You may only want to reveal a particular field if someone meets 2 or more different criteria on the form. This feature allows you to send respondents to a distinct thank you page based on their responses to fields. Once set up, people will be redirected to the web pages you designate depending on how they fill out certain fields.